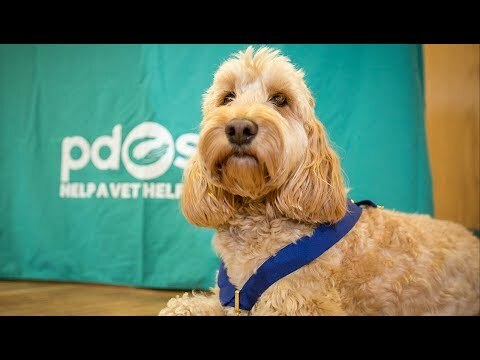 We’re really proud to announce that beloved family pet, Teddy, has been awarded the PDSA Gold Medal for life-saving devotion, after she alerted her owners when their young son Riley became perilously trapped in a tumble dryer. Teddy, the three-year-old Cockapoo, was honoured at a special ceremony at Belfast PDSA Pet Clinic on Shore Road. Teddy was accompanied by Aaron and Gillian Gedge-Duffy and their four children, Sophie, Sasha, Freddie and Riley. On 13 November 2016 Teddy, the family pet of the Gedge-Duffy family, save Riley, who was five at the time, from horrific injuries when he became trapped in a tumble dryer. Riley, who has Down's Syndrome, had managed to climb into the tumble dryer and pull the door shut which set off the drying cycle. Riley's mum, Gillian, was upstairs at the time and it was only Teddy's frantic barking and growling that alerted her that something was wrong. She rushed downstairs to see what the matter was and found her eldest son, Freddie, watching TV. Gillian explains: "We immediately started looking for Riley and it was Freddie who spotted Riley's iPad in the tumble dryer through the glass door. Freddie screamed and I quickly opened the door, dragging Riley out of the dryer. We started dousing him with cold water." Gillian called Riley's dad, Aaron, who happened to to be pulling up at the house. Aaron rushed in and put Riley straight into a cold shower, in the hope of minimising the burns he had sustained to his arms, back and head. Aaron called 999 and an ambulance car arrived within six minutes, followed by an ambulance. Riley was taken to Ulster Hospital where he received treatment for bruises and burns. Discussing Teddy's actions, Aaron commented: "Teddy has always been a special dog – she’s very intelligent, attentive and she loves the children, but I am totally in awe of how she acted that day. I know if Teddy hadn’t have done what she did, we’d have been planning a funeral. We owe her everything and I'm so proud of her." The PDSA Gold Medal is the highest honour for outstanding animal bravery and exceptional dedication in civilian life.